The Prime Minister had earlier on Sunday accused Mr Naidu of betraying everybody from political allies to members of his own family. Chandrababu Naidu dismissed PM Modi's allegations, saying that all his finances are accounted for. He also took exception to the Prime Minister questioning his "accounts"
Andhra Pradesh Chief Minister N Chandrababu Naidu on Sunday delivered a stinging rebuttal to Prime Minister Narendra Modi's allegations that public funds were being used to finance his political campaigns, and warned that personal attacks against him would only beget a similar response. 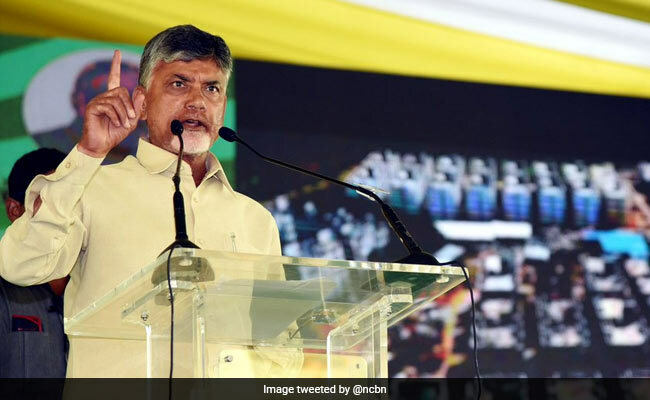 On his first visit to Andhra Pradesh after the BJP's break-up with the Telugu Desam Party (TDP), PM Modi had earlier on Sunday accused Mr Naidu of betraying everybody from political allies to members of his own family. "Why does he (Chandrababu Naidu) often claim that he is senior to me? Yes, he is senior to me in things like switching sides, forming new alliances and "backstabbing" his seniors -- just like he deceived his father-in-law (NT Rama Rao)," he said at a rally in Guntur yesterday. Understandably, the jibe did not go down well with the chief minister. "I don't usually make personal attacks, but Modi is now forcing me to do so with his comments. He speaks about bringing about a triple talaq law to help Muslim women abandoned by their husbands, but he has no answer if anybody asks him about his own wife, Yashoda Ben," Mr Naidu said. The Chief Minister also took exception to PM Modi hinting that his son, Nara Lokesh, was being given more prominence in the TDP. "Yes, I am proud to be Lokesh's dad. I have always promoted family values, but as Modi has no family, he will not understand them," he quipped. Although Mr Naidu was in Vijayawada at the time of PM Modi's arrival, he sidestepped protocol to refrain from receiving him at the airport. Later, at an event held to distribute land pattas, he rejected the Prime Minister's claims that he was diverting public funds to finance his political campaigns. "Modi makes wild allegations. He speaks as though he asked us for accounts, but we did not reply. I have nothing to hide. Our accounts people, or even the Comptroller and Auditor General, can give all the answers. I don't have to reply to anything," he said. He, however, questioned the Prime Minister's penchant for wearing expensive clothes that "cost up to one crore rupees". "Gandhiji was a simple man. I have also worn the same kind of clothes for 40 years. Only today I am wearing black for the sake the people," he said. PM Modi was greeted by hordes of TDP, Congress and Left activists waving banners of "No More Modi" and "Modi Never Again" upon his arrival in Andhra Pradesh. Black flags and balloons were also waved by protesters while the Prime Minister's convoy was on its way to the venue of the rally in Guntur. His effigies were set afire in some places. The TDP and other opposition parties accuse the Narendra Modi government of going back on a long-awaited promise of providing special state status to Andhra Pradesh. PM Modi, however, claimed that he had gone for beyond offering the special status to Andhra Pradesh. "As Chandrababu Naidu couldn't develop the state nor give accounts for his expenditure, he is cooking up lies," he said, adding that the Polavaram project has turned into a means for the Chief Minister's family to make money. Nara Lokesh, who is the Information Technology Minister in the state government, trashed the allegation. "If they have even a shred of evidence, they should take action. We are ready," he said. Later in the day, People's Democratic Party chief Mehbooba Mufti tweeted in support of Mr Naidu. "There are no permanent friends or foes in politics. But its doesnt behove the PM of the worlds largest democracy to resort to personal attacks. In solidarity with @ncbn garu," she said.